Version 11.0 introduces classes to APL. In version 11.0, namespaces only have the script form if they were created using the editor or using the ⎕FIX function. Namespaces created using ⎕NS do not have a script. Modern operating systems and development tools have good support for files containing Unicode text, which means they can contain APL symbols as well as all "human scripts" in current use, plus "extinct" languages like Hieroglyphs, Tolkiens Tengwar scripts, and Klingon (very few fonts exist which contain all of these languages, but they are on the way). Windows allows you to select so-called Input Mode Editors (IMEs) which define keyboards for subsets of Unicode, and Dyalog provides an IME which reads your standard input translate table and provides an APL keyboard for use with text editors and other non-APL applications. All of the above combined make it attractive to look at storing classes and namespace scripts in text files and using standard tools to manipulate them. SALT is the Simple APL Library Toolkit, a tool for storing class and namespace scripts in text files, providing an alternative to the workspaces or component files as repositories of APL source code. In a nutshell, SALT allows you to save to, load from and list files containing classes' source. The source code can be edited in APL, or files with source in them can be edited with an editor that supports Unicode files (UTF-8 or UCS-2 file formats, to be precise). When SALT saves a class' definition (source) onto a file it uses the extension 'dyalog'. The Dyalog version 11.0 installer sets up an association which instructs Windows to open these files with Notepad, a very simple text editor included with windows – which supports Unicode. 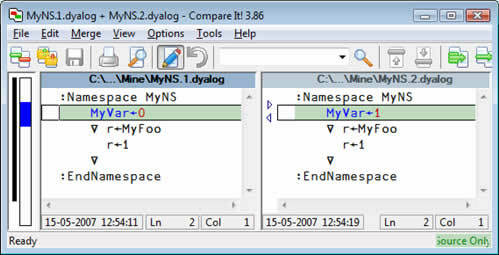 Therefore, double-clicking on a file with the .dyalog extension will open it with Notepad automatically. When enabled through the registry entry SoftwareDyalogDyalog APL/W 11.0SALTAddSALT, SALT is loaded into the session object (⎕SE) so that it does not interfere with application code. By default, SALT stores script files in a folder called Classes, below the main Dyalog program folder (but you can change that). When the editor fixes a class or namespace which was loaded by SALT, SALT will offer to write the modified source back to the file. This allows you to keep source code in script files without changing the way you work. Saving a class or namespace using the -version modifier switches on simple versioning. Once a file is versioned, each subsequent save creates a new file rather than overwriting the existing one. Multi-developer projects will probably benefit from the use of SubVersion or other source code management tools rather than SALT versioning. Many "industry standard" management tools support UTF-8, and are therefore well suited to managing Dyalog Source code. SALT provides simple tools for storing source code in Unicode text files. This allows the use of external tools to manage and deploy applications. It also allows us to organise the source in a number of new ways. We will explore these possibilities further in future articles!